How selfless can you get? – Forest & Bird How selfless can you get? How selfless can you get? Some people sail through life without doing much for their community at all. And then there are those who go to the opposite extreme, giving over perhaps their retirement, or a huge chunk of their spare time, to making the world (in our case, the natural world) a better place. These people’s extreme selflessness doesn’t just make a small difference, it makes a huge difference. Forest & Bird is fortunate to have a wealth of such people among its members. Our 90th anniversary dinner in June was an occasion where that was plain to see, as the Old Blue, Pestbuster and Golden Spade prizes, and a Distinguished Life Membership, were awarded. The CVs of these kind-hearted and humble high-fliers are extraordinary. Carole Long was made a Distinguished Life Member of Forest & Bird, for the 34 years she has spent as an extraordinarily active member of Forest & Bird. The campaign notches on her belt include the Save the Manapouri campaign of the 1970s, and the establishment of the Whirinaki Forest Park in 1984. Dr George Mason, who was awarded an Old Blue, has personally paid for a raft of scholarships that have put students through their science or environment-based studies, in New Zealand, and at the University of the South Pacific. George has also donated generously to a project to clear invasive vines in Vanuatu. Another (new) Old Blue, Canterbury’s Rosalie Snoyink, co-founded three activist groups that have made a real mark in protecting her region’s waterways from the current scramble for irrigation water. Coromandel farmer Arthur Hinds received an Old Blue for his part in tripling the number of kiwi living in his area, and for being such a staunch advocate for 1080. Rod Morris got his Old Blue for his enormous contribution to the Denniston campaign. He has toured the country delivering talks on the campaign, written numerous letters to newspapers, conducted media tours, helped organise last year’s Denniston Bioblitz, and took photographic evidence for Forest & Bird’s Environment Court case. Hermann Frank from Timaru was recognised with an Old Blue for his pioneering research into the local populations of geckos and skinks in South Canterbury. Very little was known about these animals before Hermann began his work. Former scientist Susan Millar has been key to the planting of 55,000 native trees and plants around greater Wellington, an achievement for which she was given the sixth Old Blue. Many of the trees have come from seedlings raised by growing programmes in schools and prisons, programmes organised by Susan. 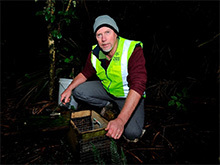 Grant Vincent, the chairman of Forest & Bird’s Gisborne Branch, won the Pestbuster Award for his work in leading the dirty work of “cleaning up” the pests that ravage Gray’s Bush Scenic Reserve. And Ian Price from the Nelson-Tasman branch of Forest & Bird was awarded a gold-painted spade at the dinner – the eponymous prize in the “Golden Spade Awards.” He received the trophy for having spent up to three days a week, since 2011, managing the replanting of the Paremata Flat Reserve near Cable Bay. His duties include recruiting volunteers, liaising with the council and landowners, carrying out monitoring work, compiling progress reports, doing pest control, sourcing seeds, and finding sponsors. The amount of work put in by Carole, George, Hermann, Susan, Rod, Arthur, Rosalie, Grant and Ian is remarkable. But they are just some of the hundreds of people, all around the country, who voluntarily contribute to Forest & Bird-lead projects. All these volunteers are remarkable, in that they do as much as they are each able to protect what makes New Zealand such a great place.